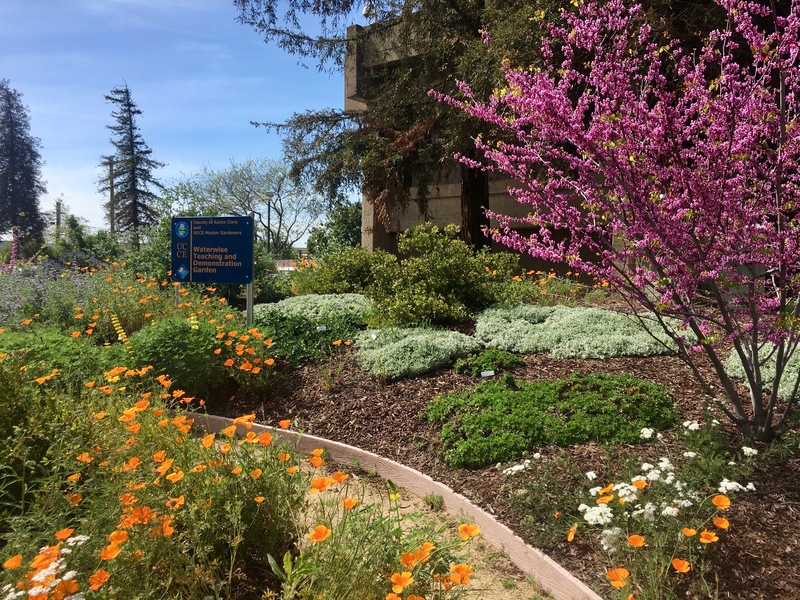 We have two demonstration gardens outside the Santa Clara County building where the UC Master Gardener offices are located, the Berger Edibles Demo & Teaching Garden and the Berger Native Demonstration Garden. 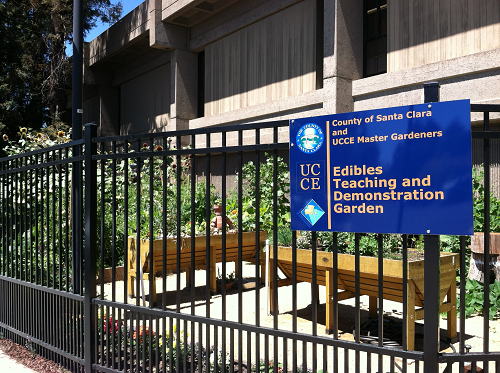 The Berger Edibles Demo & Teaching Garden is open to the public during our workday on Tuesdays from 10:30 a.m.–12:30 p.m. It is viewable through the fence other times. We also offer occasional Open Garden Days. The Berger Native Demonstration Garden is always open for viewing. Work days are on the 4th Tuesday of every odd month from 10 a.m.–noon (excluding holidays). Please join us if you’d like to help out and/or learn more about California natives and their management in the garden. Our garden was built in 2013 and represents what an average gardener in this area can accomplish. You are welcome to visit the garden, help us plant, weed, harvest or just ask questions. We love to talk about gardening and share what we know regarding the plants and seasonal vegetables we grow in the Demonstration Garden. Features include vegetables in raised beds mixed with ornamentals and rustic garden objects/art. Our plantings change seasonally, offering a visual example of what can be grown in your own garden year round. We will offer several Open Garden Days for the public and County employees. See our Calendar. Visitors will have the opportunity to come into the garden and work with us hands on with tasks such as seeding, transplanting, soil management, composting, vermicomposting and more. Short “mini” presentations will be given to County employees and the public at large during the lunch hour. 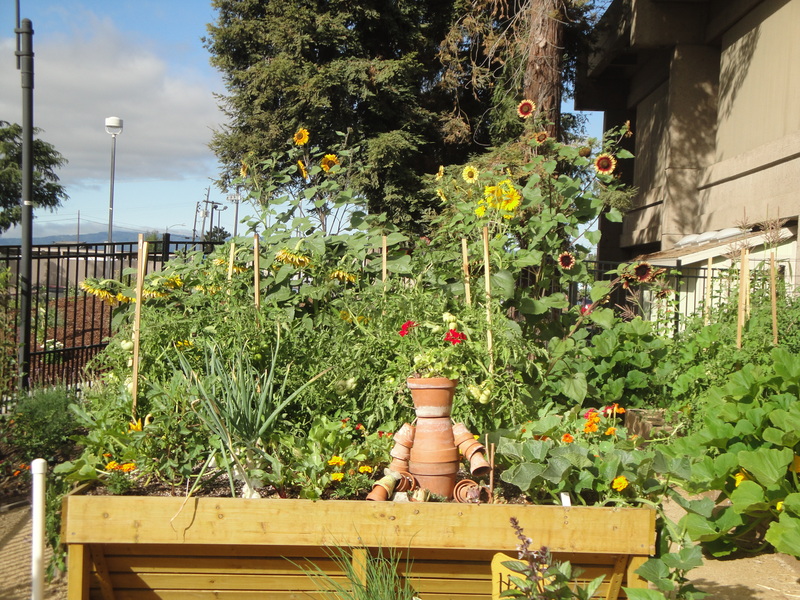 Our goal is to teach research-based gardening skills to the community in order to improve lifestyles through exercise, healthy eating (lots of vegetables! ), as well as support the environment by using ecologically sustainable practices. Nothing fancy, just hand tools, organic amendments and hard work. Formerly named "Waterwise Teaching and Demonstration Garden"
The always-open Berger Native Demonstration Garden showcases California native plants. Relying primarily on Arboretum All Stars, it consists of dependable and showy plants. Demonstrating a range of drought-tolerant landscaping choices, it's a great example of what a lawn-replacement project might look like. The garden was created in Fall 2013.